Hibiscus and ginger are two tastes that complement each other so well it's like they were made for each other. Both of these plants thrive in the tropical climates and Jamaica Sorrel is one of my favorite summer drinks. This blend is an antioxidant powerhouse that helps keep you feeling good all day long. 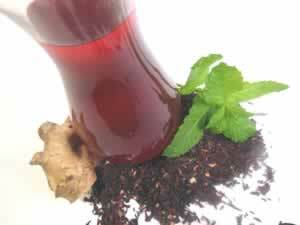 Recipe Instructions: Herbal Tea :Pour boiling water over the herbal blend and let steep for 10 to 15 minutes. The infusion will turn an inviting, ruby red. Serve hot or cold over ice with a sprig of mint.